That's right, the Foster Farms Chickens, aka The Foster Imposters! A pair of Arkansas factory-farmed chickens flee their trailer park and head to California, so that they might be killed, eviscerated, and served up as meals by Foster Farms. Their vehicle? A beater '67 Belvedere! Thus was the idea for Team Faster Farms Chickens born. …and some light blue house paint. The Imposters' Belvedere has one yellow door, so the race car's original color was retained there. Now let's watch another ad! These chickens are serious about winning! You might recognize this bird as Jack Astro, creator of the Project Car Hell Song. Be sure to check out the Team Faster Farms Chickens' website when you're done here! 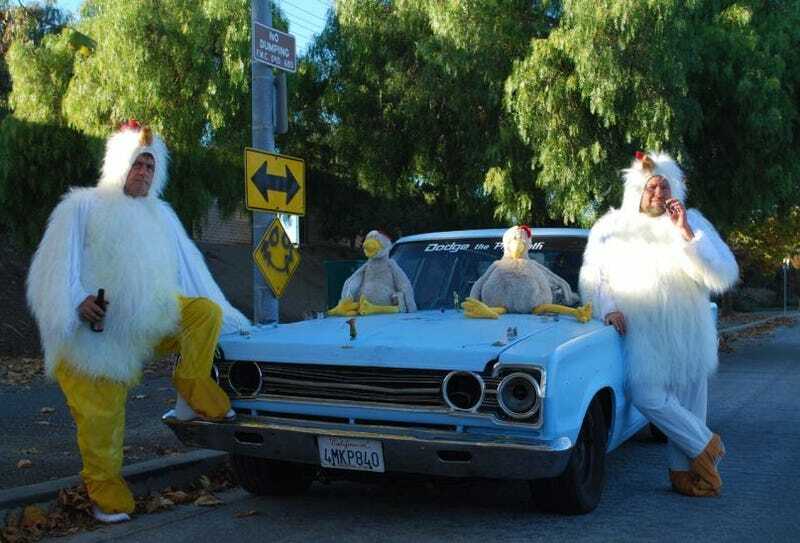 With 318 screamin' cubic inches under the hood and a car that's already survived a 60 MPH wreck into a row of parked cars, the Chickens fear nothing! They found a B&M floor shifter on a junked Ranger at Pick Your Part, and the glass doorknob adds a touch of class. The chicken suits weren't quite up to Foster Imposters specs, so Adrian had to make a few adjustments. First, a little feather trimming. Then a coat of Farm Equipment yellow paint on the legs.